Land Sea Services is proud of advances made in Golfito to further the humane treatment of dogs and cats. Community groups such as ZAPPA and McKee are reaching out to give low and no-cost care to 'under privileged' and street critters, greatly reducing the population of homeless animals in our area. Your contributions make possible the Low Cost and Free Clinics being sponsored by area volunteers and special service by veterinarians to selected animals in need of foster and health care in anticipation of adoption . Each contribution of $20.00 sponsors a dog or cat that wouldn't otherwise be able to receive vaccinations, spaying or a temporary foster home placement - and wouldn't have been considered adoptable! Your generous contribution of $250.00 will sponsor a neighborhood mini-clinic with spay services for up to a dozen needy animals. That's a potential reduction of over 50 unwanted births in a neighborhood in the first year alone. Do the math?! It's a loving and needed investment. Please consider supporting our "pet project" by bringing a tax deductible donation to our office when you visit Golfito. Receipts will be given along with our THANKS! Less than ½ the land on this lot is constructed upon. This location could easily support a large second home, guest cabinas, apartments or even a small hotel. The Main Street frontage of over 100 meters is perfect for a small commercial ?strip center? which could offer multiple retail spaces and there is plenty of room within the compound for off street secure parking. The municipal green zone in front sets the property back off the road and can be custom landscaped by the new owner for lovely 'curb appeal'. For an investor looking for something with residential and commercial potential, on the waterfront along main street Golfito is a GREAT LOCATION with nearby restaurants, bars and marinas. Principals or their representatives may contact the seller?s agent directly at Land Sea Services in Golfito for further information or to schedule a showing of this "premier property". NEW on the Market . Asking Price: $950,000. This gracious 3 bedroom, 2.5 bath home has been fully restored and upgraded to meet the criteria of today's more discriminating buyers. It's on more than a half acre of manicured land, in the historical area of Golfito lovingly known as 'The American Zone'. Back in "the day", the workers were prohibited from entry to this exclusive neighborhood where the U.S. executives lived and shared common recreational areas. Today many homes have been restored, some converted into hotels and small restaurants and one boutique style hotel chain rebuilt a few of them to create a luxury resort with pool and spa. This American Beauty Boasts grand porches and verandas, a large kitchen with modern features from dishwasher to pantry to wet bar. Exotic hardwood floors throughout, hand carved doors, custom cabinetry, jacuzzi tub in mater suite, high quality fixtures and electric installations. and a fully insulated roof. 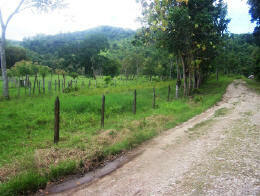 In a quiet country setting, this 3/4 of an acre property is located in the area of Golfito called La Mona. With an outstanding and unobstructed view of a scenic pasture and picturesque mountains, a majority of this property is under full shade coverage with an assortment of trees: mango, avocado, coconut, guanabana, cashew, water apple, papaya, citrus, bananas, and many more. ﻿﻿Enjoy outdoor dining under a covered patio overlooking the pasture. This property also features a secure bodega, which encompasses a fridge/freezer and washer, and enough room for storage and a work shop. This property is fully fenced with a concrete-steel gate that leads to a gravel driveway and covered parking. This two bedroom one bath home is made from concrete block with steel and hardwood construction, and comes furnished including appliances. A convenient location to town, with a ten minute drive to shopping in Golfito or Rio Claro and a one hour drive to Paso Canoas, the Panama Border. BINGO!!! Yes! We do have a NEW coveted waterfront listing in the marina area and YOU CAN PULL YOUR OWN BOAT UP TO YOUR PRIVATE HOME! This property offers you a 'double lot' - 2 parcels side by side. One has been constructed upon with a small 2 story home including a garage. The second lot is enclosed in security fencing and offers you room for a recreational - patio area or an option to construct. Your cement pier is built over the bay in front of lot 2. Seller will entertain serious offers for one lot only. Each offers it's own paperwork , Municipal tax registration and survey. Contact us for more information. Imagine a turnkey, fully furnished, waterfront house on a calm bay off the Pacific….A great deck overlooking your private dock and the sunsets over the Golfito Island. You aren’t dreaming – this is it!! This concrete home in good condition offers 2 bedrooms and 1 bathroom, a large kitchen and living room plus room to entertain on the lovely wood deck. Appliances and furnishings included. This parcel is 360m2 according to the registered survey, which includes the area the home is situated on plus 2 small adjacent lots that were acquired for boat and car parking as well as to landscape. Could this be your vacation get-a-way, revenue generating rental, your home for retirement or a base for your dream charter fishing business? Everything is ready to move in including electricity, phone, TV, A.C. and internet hook-up. All Included!! An ideal lifestyle home NEW on the market! A wonderful retirement property or enjoy as your seasonal retreat. Perfect in many ways for segregation and development or a small tourist project. Private home, only minutes from the local Golfito marinas, may be exactly what you've been looking for. It's an ideal "lifestyle home" - NEW on the market! This one will be of interest for buyers seeking a full time retirement property or one you can enjoy as a seasonal retreat. Tucked off the main road with a deep private gated driveway in, the property includes the primary home with all furnishings, a small caretakers home, a large tool room, deluxe potting shed and adjacent green house.... plus extensive gardens with trails. 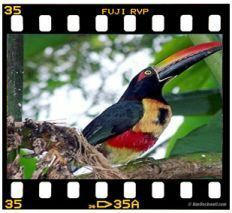 It's backed up to a lush rain forest wilderness corridor - Perfect in many ways for a small tourist project. Additionally, it's registered as 2 separate parcels, allowing for easy segregation for a return on your investment or to develop a second, independent home or cabinas. The home's open floor plan offers a large kitchen and BBQ patio that wraps around to feature an infinity plunge-pool and outdoor dining set.... all nicely laid out for entertaining, taking full advantage of the beautiful forest and bay views. As garden enthusiasts, the sellers have collected and cultivated abundant botanical specimens and landscaped to encourage walks in the gardens and visits from the local birds, butterflies and monkeys. The recent loss of a dear ex-pat community member leaves a grand vacancy in our hearts....and now a vacant home as well. This 20 year old home was built to last for a retiree. 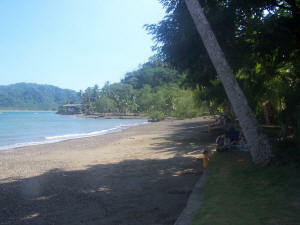 It is conveniently located in the area of La Purruja, Golfito, only minutes from the town center and bayfront marinas. NEW on the market, it has been priced well below "market value" and is sure to appeal to locals who know the market, first time buyers as well and certainly it's a "must consider" for out of the area buyers ready to move quickly. Constructed at street level of cement it offers 2 bedrooms, 1 bathroom, a small living-dining area and kitchen plus an additional second bedroom and bathroom with its own private entry below. Located on a large lot of 920m2 with 79 meters of street frontage- there is plenty of area for expansion. Car port. Titled. Clean and clear of debts or liens. Although fully habitable, it needs some catch up on the maintenance - but in reality, you could never buy the land and construct for this price, making it a true "special value". IS THIS THE ONE YOU HAVE BEEN WAITING FOR??? Is NOW the time to retire or relocate to Golfito?? My advice? Do not wait. Call now for an appointment to see this listing and other great homes now for sale in our area. A stand alone home with a proper yard, this residence is set back from the road and nearby homes by it's own generous green zones. Although located on the fringe of an urban development, it lays above and outside the neighborhood. This situation offers a certain privacy and distinction that many will appreciate. Nature Reserve Golfito "A Birders Paradise"
Golfito is the home of an incredible variety of wildlife and birds...and this refuge below is a "Birdwatcher's Dream Come True." A clear area for construction, more than 100 titled hectares of wilderness, and over 5 hectares for development. Perfect for campground, bird watching trails, and hiking to waterfall. This exclusive Rainforest Lodge is surrounded by the undisturbed primary lowland rainforest of the Piedras Blancas National Park, an extension of the Corcovado National Park and the clear waters of the Golfo Dulce. 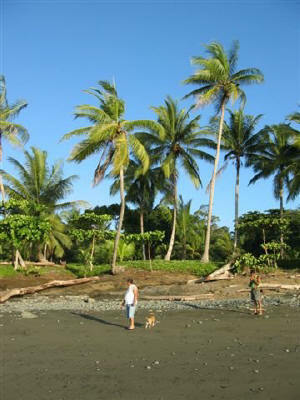 The remote lodge at Playa San Josecito is only accessible by boat from Golfito or Puerto Jimenez. 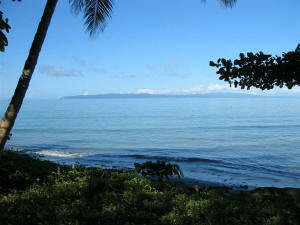 2 lots along the beach and adjacent creek offer 'the dream' at an exceptional price. 2 Costa Rican Corporations included for your registry in the maritime zone process. Regrettably, due to health concerns the seller must take the loss and liquidate this investment in our current 2010 season. Listing Agent will work with Co-op Buyer Agents. Contact us for permission to place photos on your website. One of the Best Bargains on the Market in Pavones! Adjacent to one another, these 2 large titled parcels are well situated and beautifully landscaped, offering a dream location to a retiring surfer, nature lover or even a savvy investor or developer. They are without dispute "A Top Option" in the area for construction of 2 or 3 upscale homes. Offering privacy, proximity to the surf and nearby town services, they are well suited as well for a small tourism project like a ‘B and B’ or rental cottages. The neighborhood is tranquillo- peppered with established "ex-pats" in retirement with nice homes along a beautiful winding tree lined road. Each of the lots are groomed and maintained by a caretaker who lives nearby and keeps an eye on things. 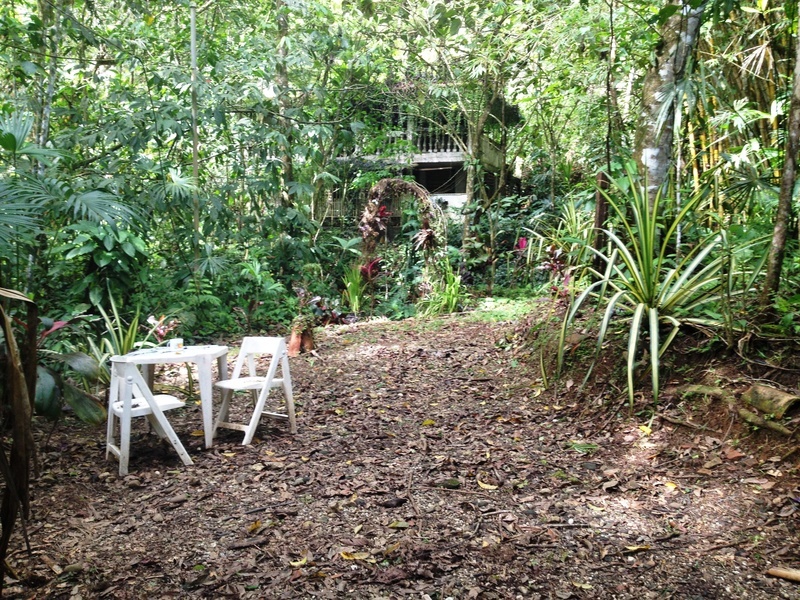 The westerly lot of the two is tucked back off of a 'cul-de-sac' in the road- bordered by a beautiful corridor of jungle and along a small river gorge. A home on this lot would enjoy the ambiance of being immersed in a beautiful, natural landscape. 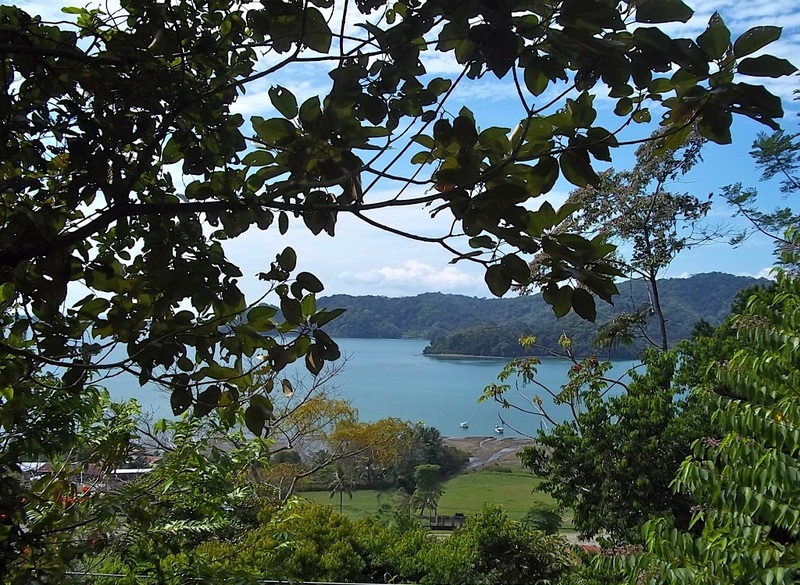 The upper site, the easterly lot, enjoys the elevated placement with a coveted view through the trees out to the Golfo Dulce and Osa Peninsula. The lower half of the easterly lot is situated at the road front with mature trees and a hedgerow border. As I see it, the property has three separate and private entries off the road … meaning the natural layout of the land and the configuration along the road lend 3 natural building sites, making for easy and elegant multi-residential or lot split possibilities. Both lots offer more than 2 acres each with a combined total of better than 5 acres. Spring or well water. These lots compare very favorably to anything else we've seen on the Pavones market. Shop around and then come back to us. This listing is a "Must See". This very exclusive location and beautiful home at the beachfront are NEW ON THE MARKET, listed for the first time. lf you haven't been to this area of Costa Rica on the Peninsula de Osa, you haven't seen the BEST the country has to offer a nature lover. This appendage of the Corcovado National Park corridor stands out as superior for it's rain forest bursting with wildlife, the jungle canopy that sprawls down to meet pristine shorelines, the world class surf, the brilliant sunrises over the Pacific Ocean and spectacular landscapes and seascapes in every direction . A surfers retirement fantasies don't get any better than this one! Prudent investors will consider too that this home could be a top dollar 'vacation rental' when not in personal use. Amenities of this 3 bedroom home include nicely crafted hardwood finish details, a quality solar power system and a small pool built into the deck. Wow! Talk about beautiful views! Located along the border of the protected Golfito Refuge, this titled lot is just outside the boundaries of the protected 'reserve' and there will be no inconveniences in pulling permits to build. It's on the public road with plenty of level area to support a grand estate home, an eco- lodge project or multi-residential development. Located exactly one mile up the road from the last electric pole. Self generated power or a project to extend the utility grid would be needed to supply electricity. Deep Water Yacht Basin, Old Hotel Site plus 2 more lots. Back in the Banana Company days, this was the site of the elegant Miramar Hotel, a legend in it's time by all accounts of those who were here "in the day". After an untimely fire burned down a major part of this piece of history, the hotel was destroyed, leaving an "estate quality" property, mature landscape and trees, a stout retaining wall at the waterfront and a deep water basin....perfect for marina, commercial or upscale home development. The parcel was subdivided and the southerly half was sold, and is currently used as a private residence with a pier and dock. This half, now being re-introduced to the market, includes four parcels - 3 of which are untouched since the hotel days and one of which was used in the prior decade as a marine workshop and manager residence with docks and other marina facilities for a sport fishing fleet. The four parcels can be purchased individually or jointly. The seller will consider terms for a qualified buyer. All with Title. Lovely parcel for residential/multi-residential or commercial use. Deep draft at waterfront. Mature trees. Raised above street level with a deep community green zone along the street which could be "adopted" and incorporated into the private landscape plan. Adjoining 'Lot One', this is the second beautiful parcel for residential/multi-residential or commercial use. Both parcels together would lend ample area for an elegant boutique hotel project. An all new "Miramar Hotel"? Mature trees. Elevated somewhat above street level. Gorgeous! A bit of "ruins" of the old hotel still remain including stately steps to the entry and others leading down to the waterfront. It makes your imagination run wild with the thought of how pretty this place was and could be. Exclusive estate-type home, upscale town homes with docks, a distinct hotel project... This is a beauty- and joined together with lots one and two?? Wow! This parcel lends itself most naturally to your commercial or multi-residential use. Marina, condominiums, hotel-restaurant, sport fishing club??? Includes yacht basin with 'breakwater', large industrial workshop, manager apartment and office. One of a unique few residences on Playa Cacao, this hilltop home in the forest reserve offers unrivaled privacy on the edge of a wilderness corridor with an incredible, unobstructed view over the bay and beyond. Convenient to town and the waterfront, this special Golfito retreat can be accessed in 15 minutes by back road behind Golfito town center or easily approached by taxi boat via the shoreline below where you can set a mooring for your skiff. Built in 1980’s with a clean and simple style using native hardwood, the floor plan includes 3 bedrooms, 1 bath, a large kitchen, salon and dining room plus a large enclosed screen porch where a great majority of your time will undoubtedly be spent – taking full advantage of both the view and fresh ocean breezes . Expansive lawn, botanicals and mature fruit trees. More than 3.5 acres. This home would be a good choice for a primary residence or a nice one for your vacation retreat or rental. Some refurbishing required. Motivated Owner Reduced: $178,000. $150,000. About 5 Hectares of POTENTIAL! This parcel may be perfect for your private retirement home! 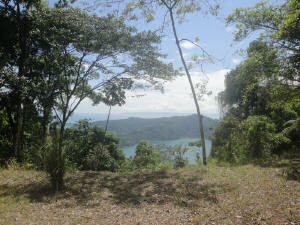 A wooded site in the Purruja countryside only 7 minutes from Golfito and the waterfront. Springs of water, electricity on the road in front and it's in the apex of an area "gaining momentum" with new neighboring ex-pat home construction. Clear possession. Follow this road past the pastures and teak farm...but don't go beyond the old "monkey reserve" and you'll arrived to the parcel. Check it out- and call us to learn more! Motivated Sellers will listen to offers. This old Banana Company home is in need of a full reconstruction.... needs work. But it's a great Golfito location with a VIEW out to the bay and would be well worth the effort of transformation to a lovely new townhouse for your retirement residence or rental income. The current layout is downstairs living and dining with attached open kitchen, a laundry room, bathroom and guest room/office. The stairwell leads up to a large common landing area and 3 basic bedrooms. I can't help but imagine laying this second level out differently to create 3 small or 2 larger bedrooms and an added bathroom plus opening it up in front to add a veranda over the entry breezeway below. The view to the bay entry is quite nice and you'd be able to take full advantage of the westerly orientation, enjoying sunsets over the water with the right remodel design. In our photos you can see the neighboring unit, fully remodeled previously to take advantage of this view. A Titled property. Convenient to town. Corner lot. The side yard of the house is a vacant area for car parking and boat on trailer but would be area available to expand the home if you wanted a larger place, enclosed yard or garage. This one will fill the bill for several of you investors or budget retirees. Distinct Golfito Commercial Location for Retail, Office, Boutiques or Tourism Business. Corner lot. 269 m2. Construction in good condition. Main street visibility. Includes 2 retail units, one 1 bedroom rental apartment and 1 main house with 3 bedrooms and BAY VIEW. Owner will consider a property split with sale of the apartment and one retail unit- easily converted to second apartment if desired. $165,000. with title. Golfito Salerosa Lots: "La Gamba"
Located on a rural public road just 15 minutes outside of Golfito and 30 minutes from Rio Claro on the road to La Gamba village, a few miles before the Esquinas Rainforest Lodge "Biological Station" and adjacent to the Avellan Trails and Waterfall - Surrounded by the Piedras Blancas National Park.... This new to the market collection of lots for construction will meet the criteria of many who are looking for a natural forested setting outside the urban area of Golfito without going "too remote". An eco-lodge project, private retirement home or a small private community development would all fit beautifully on one or more of these sites, immersed in the exceptional natural beauty of the area. Over the past 10 years a great deal of the private wilderness areas and the larger parcels have been picked up by preservationists and investors interested in keeping this area of Golfito and it's development path as natural and 'green' as possible. 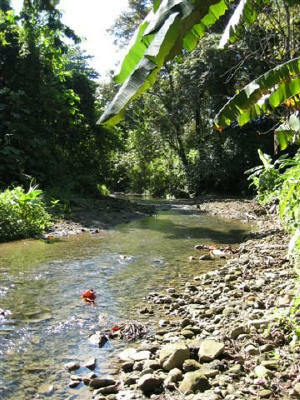 The existing close knit La Gamba community is determined as well to preserve themselves as an example of an ecologically balanced community dedicated to preservation and responsible exploitation of their tropical surrounds. To date, outside the primary village, only a few private homes have broken ground in the immediate area, planting the seeds for what will most likely be a slow but certain growth community. Both water and electricity are available at the street. Each lot is accessed by a private easement off the public road. Price and Terms negotiable with deep discounts for multiple lots. 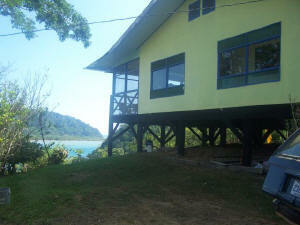 This magnificent property is an original homestead with spectacular views of the Gulfo Dulce and the Osa Peninsula. Much of it is a wild and untouched gem of natural beauty. Some of it is reforested to enhance the natural corridor, but ample area has been selected for your dream home or eco-lodge. The building sites are uniquely situated to not disrupt any original forest trees, or the vital corridor. Multiple building sites offer access by road. Electricity is available at the road. Documented water rights granted from a spring on the adjoining parcel. This titled rainforest property is enhanced by a Waterfall, Mangrove Preserve, and River – all lending maximum possibilities for exploration and enjoyment. A nicely built, small wooden home is constructed on site with a resident caretaker. 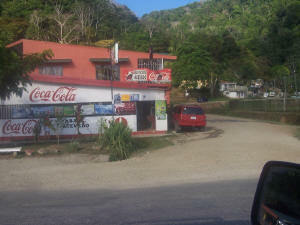 The closest regional airport is in the fishing center and historical old United Fruit Company town of Golfito. 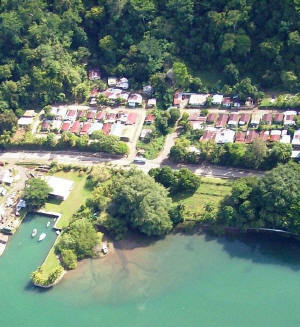 Many people keep yachts and sport-fishing boats in the modern marinas in Golfito, 20 minutes by boat to this property. 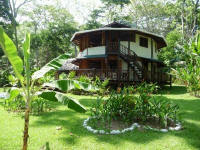 The next closest airport is in Puerto Jimenez- just a thirty minute drive. A preliminary development plan for an exclusive resort is available for inspection including a Retreat Center, Bungalows, Recreations Center, Beach Bar and plan for infrastructure. 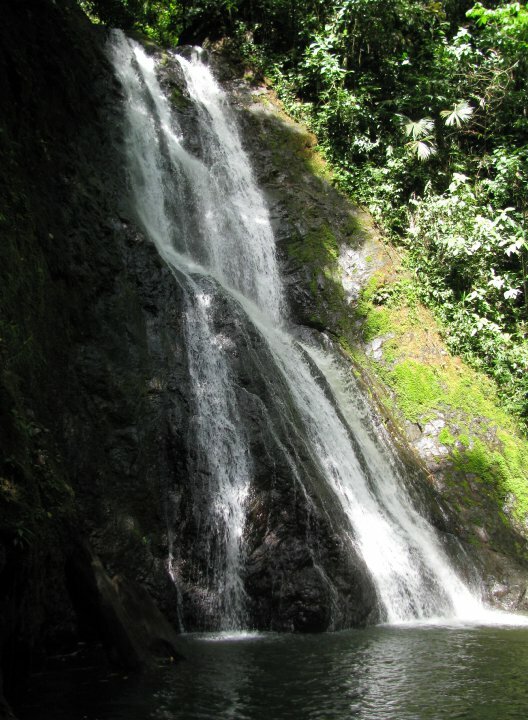 Situated between two national parks, Corcovado National Park, and Piedras Blancas National Park, this property is part of an intense biological corridor which is home to four species of monkeys, 4 species of large cats, dozens of rare birds and countless other jungle species. There are wonderful possibilities with regard to sustainable agriculture on this property, with some fine rolling pasture on the upper portions. The beach is also accessible by boat and offers a building site as well. 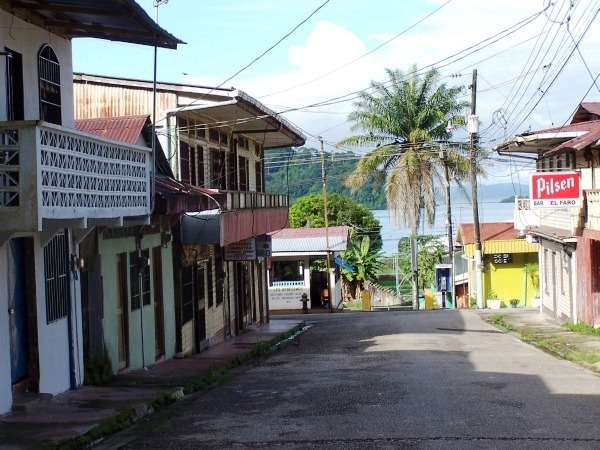 Perched above town along a turn in the old “Tower Road”, you will encounter this beautiful titled lot with expansive views over Golfito Bay, the island and beyond to the Osa Peninsula, Golfo Dulce, and Pacific Ocean! 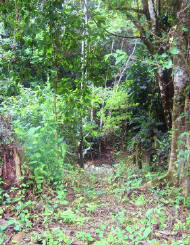 The property is partially forested with a perfect clearing for your construction at low level. 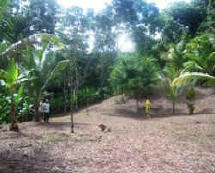 About 7,000 square meters (1.75 Acres) of land in total, offering aprox. ¾ quarters of an acre clear of significant trees to plan your sustainable project. The rest of the land would logically be part of the wildlife corridor, an area for conservation. A truly “AWESOME VIEW”!! 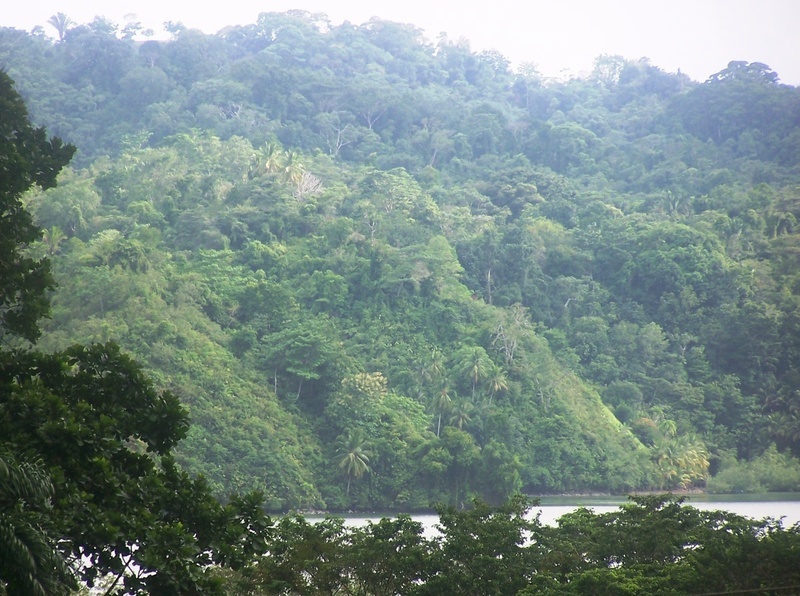 Located within the Golfito Wildlife Reserve, this is one of a small handful of exclusive, titled parcels, with the right to construct along that road – a zoning plan is established to protect the precious rainforest corridor and Golfito watershed. "Off the grid" but on a year round maintained road less than 10 min from town, this would be an excellent location for a small eco project or your private retreat home. Where the central urban area of Golfito ends and the wilderness begins, a beautiful forested parcel waits for your development. Two perfect home sites - One at the entry on street level where the ?old house? 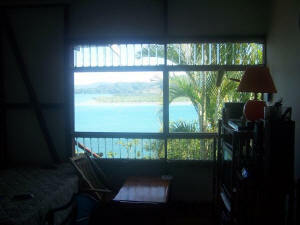 used to be and the second elevated above on the hillside offering privacy and spectacular views over town, the Golfito Harbor and the islands beyond to the Golfo Dulce. 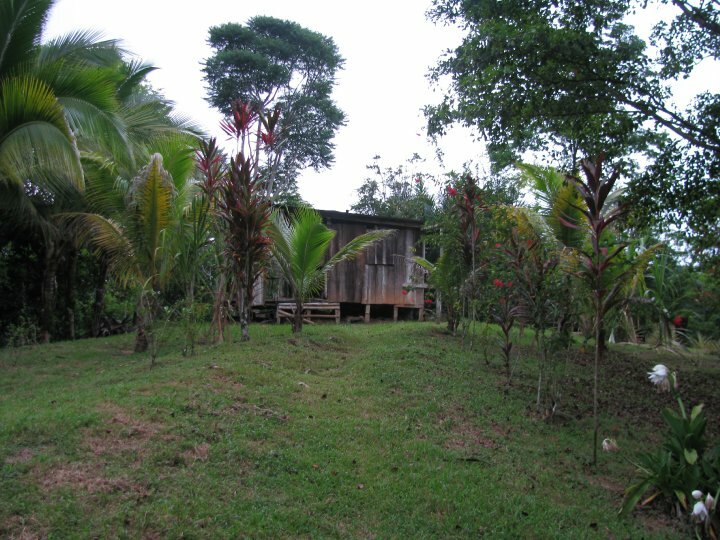 This location is the last buildable site with electricity and telephone services before heading up into the protected Golfito Forest Reserve. 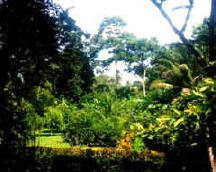 It is immersed and surrounded in abundant forest and animal life. A very unique location with both luxury home potential and tourist aptitude. MOTIVATED SELLERS will listen to serious offers. Suggested as " Best Value" on the market today! This property, located at the entry to the rural countryside area of Golfito, was formerly a popular bar-restaurant location with a dance floor and secure off street parking. It’s tranquillo location, set between several nice homes and a few restaurant and cabina projects could lend itself to either a residential, multi-residential or commercial project. The seller had picked this property up after several years of abandonment. He made a redevelopment plan and was in the beginning stages of the transition when the project was suspended. A new septic system was installed, an outdoor “Rancho Style” bar-BBQ pavilion was built in, the old build out was removed and one end of the building was roughed out as a caretaker apartment…and then “the economic crisis” hit. Like so many others, this seller has not been able to return to the project in a few years and now feels he realistically will not be able to at any time in the foreseeable future. As it stands, there is a lot of potential here – for either commercial or residential use. It could elegantly support a few townhomes or a small cabina project. It could be developed into a very nice home site with all the amenities…. And further it could support a mixed use such as a residence to the west and a separate entry business to the east. I can imagine this as a successful location for a mechanic, storage units, spa services, a family restaurant with recreational areas, or ???? The lot is fully fenced and surrounded lovely with landscape. It's nearest neighbors are 'higher end homes' of ex-pats and nationals. 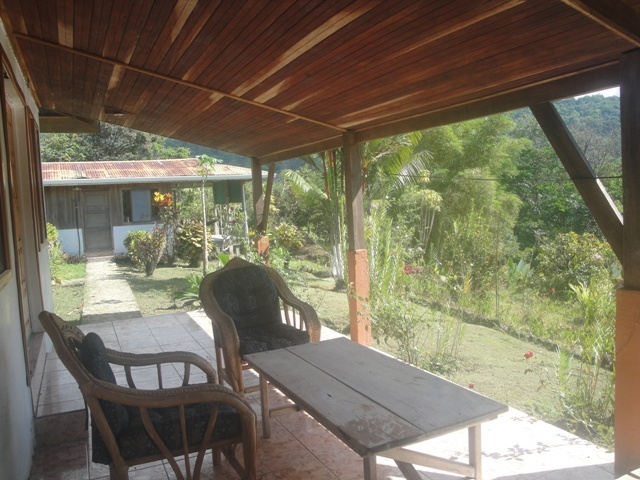 Set back off the road on the main artery into Golfito, this property is well situated and versatile. I really do consider it to be one of the best values on the market for any use. Perfect in town homesite with view! A VERY UNIQUE LISTING NEW on the Market ! If you have been to Golfito you know that a level, easy access, well located, private homesite, titled with a VIEW is almost impossible to find.... and at this price??? If you are looking to build your retirement home here and you want all the conveniences of in town living along the area of the marinas THIS IS IT! No special site prep needed to get construction started- It's all ready to go AND the bayview can be seen with a one level home. This one should meet the criteria of many..... Do not delay! Contact us for a showing or more information on new construction in our area. A beautiful beachview lot located in a buildable zoning plan. As we walked the trails of this forested property, the seller took a moment to pause in a few of his favorite spots....He reflected on his 20 years living in 'this magical place' on the La Purruja creekside and he told me he'd given it the name "Halcyon" all those years ago. The dictionary defines the verb "halcyon" as pertaining to calm or peaceful - having tranquility... and I'd say that's a fair description of this "secret" property. 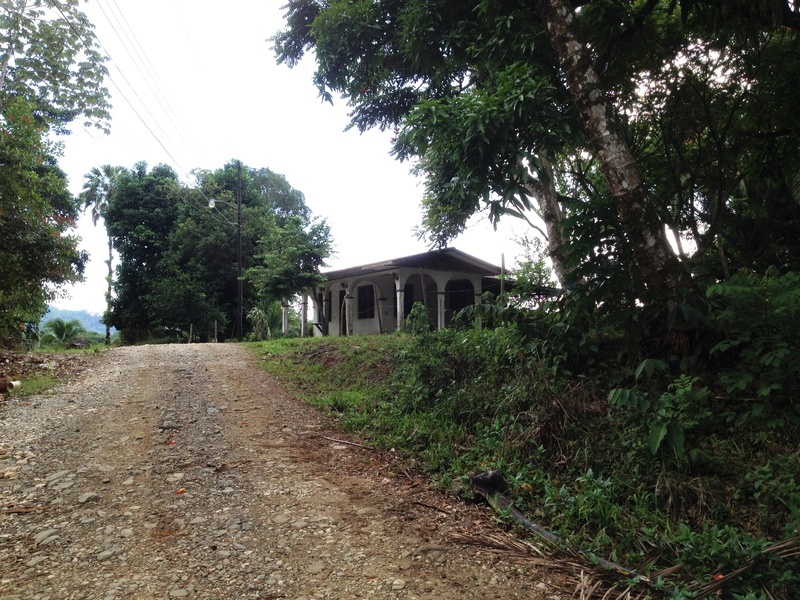 Down an access road off the main artery into Golfito, you will find these 2 titled properties, joined together by an access trail through the jungle. If privacy and nature are on your list, this one should be on your tour list. Parcel 1 measures over 13.5 hectares and is currently held for conservation only and features access to the creek for swimming and a waterfall - I could imagine an eco-tourism project that would tuck a couple cabins back on it without too much disturbance to the nature surrounding it. Parcel 2 measures just under 1/2 hectare and was the selected home site. It has a 2 story block and cement structure on it - laid out for use as a 'duplex' with a roof garden. The project was never finished and to date is completed to the 'gray stage' only; inhabited by the seller. A buyer would need to pick up and 'dust off' the project to put it back on track or modify it to suit it's new intended use. In either event, it looks to be a strong structure and is in no way a "tear down". City water, telephone and power. Contact us for more information and details on this one. The owner is motivated and will consider dividing the property into smaller parcels if that was of interest to the right buyer. He's also willing to negotiate terms of payment. Asking $300,000. The "back bay" of Golfito, along the Coast of La Purruja, is a lovely virtually undeveloped wilderness zone, often forgotten due to certain inconveniences - foremost being its location "so far off the grid".... UNTIL NOW! Yes, it's true. The "no easy access" status is scheduled to come to an end. This 6 hectare plus farm will soon offer you 2 entries. One, by boat via the maritime zone, and the second by a new rural road via a countryside entry. In good company with several other developer owned rain forest estate sites overlooking the Golfito Bay, this property is unique in that it offers 'the dream' of nature and view without the encumbrances of the Golfito Forest Reserve or National Park zoning. That means easier access to permits for construction . Contact us for more information. From Main Street to the Clouds! 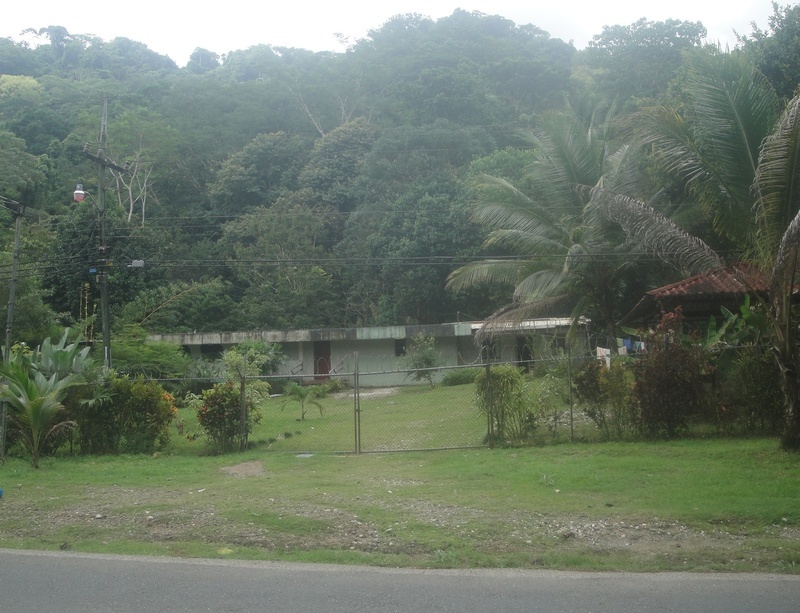 As you drop down into town, find 37 hectares of forested and secondary growth land at the entry to Golfito..... beginning along town's primary road and rising up the mountain to a clear level parcel perched above town. Come look at the options for building on the portions down closer to the towns sea level..... and then travel up the rainforest "Tower Road" and down the old logging road to another option for building under the canopy - off the grid. Lots of forested land for preservation. Fantastic Eco-oriented neighbors. Consider that segregation to create 2 properties might be a good option. Access on the upper road is year round but it is recommended for visits in 4x4 vehicles only. Contact us for more information.